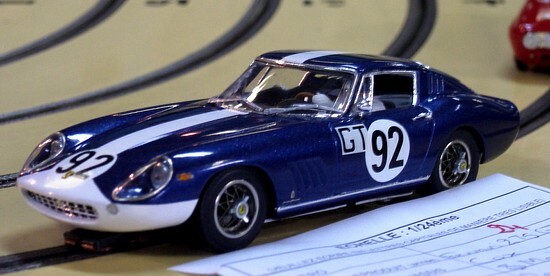 My 1/24th entry, a Ferrari 275GTB, it is a Revell plastic model, fitted to a Cox Cuccaracha chassis, the wheels are genuine Russkit wires bought on Ebay for 4 euros! This car was originally build several years ago, and appears in Gallery 6 in road trim. At the time I used a Revell chassis and 36D. The Cox chassis is fitted with with a 26D. During the race, the guide came loose after the 2nd segment, I had to race the last 6 segments with the car deslotting at least twice a lap. The colour scheme was copied from a Bang catalogue, it shows a car raced at the Nurburgring. 1/24th Linberg MGA entered by Yves Chapoutier. 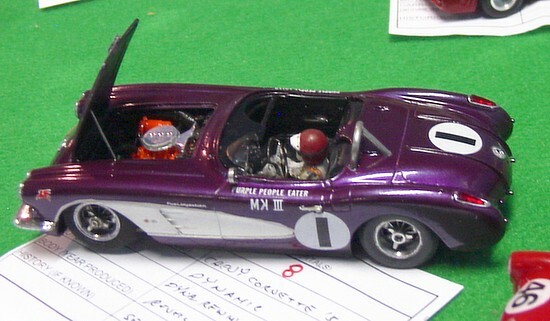 1/24th Corvette by Andy Brown Searle, including engine details. 1/24th. Bruno Novarese entry, both the car and the pick up are slot racers.